This sport center has 15.000 m2, of which 11.000 m2 belongs to the sports fields. It is located near Studentski Grad, in the municipality of Novi Beograd. It is designed for recreation, but also for professional athletes in swimming, water polo, table tennis, basketball, volleyball, tennis and others. Within the sports center “11 April”, there are three outdoor swimming pools (small, medium and Olympic), three indoor pools (small, medium and large), relax center, fully equipped fitness center, a hall for indoor sports, all-purpose hall, classrooms, air conditioned table tennis room, three outdoor tennis courts and shooting range. Sport and recreational center “11. April” is equipped with all necessary facilities, locker rooms with showers, as well as ambulance. Within the complex there are two restaurants that are available to visitors as well as a parking space with a large number of parking spaces. During summer, they organize night swims as well. Tasmajdan is sport and recreation center in Belgrade, which was opened in 1958. The center has an outdoor stadium Tasmajdan, Sport Hall Aleksandar Nikolic, Pionir Ice-hall, center for recreation and the outdoor and indoor pools. Swimming area includes an indoor and outdoor pool with bleachers for 2,000 spectators, a diving platform for diving from 1, 3, 5 and 10 meters, 16 underwater windows for underwater shooting. In addition to the training of non-swimmers, the pool is maintained by the school of synchronized swimming, water polo, diving and recreational swimming of course. This is a very famous sport and recreational center, which hosted several first world cups in different disciplines. It also has a sauna, a gym, and a massage center. It is located in one of the most beautiful parks in Belgrade, with a same name. This complexes for sports and recreation contains three outdoor pools and one indoor pool for fun and relaxation perfect for hot summer days, which can accommodate up to 3,500 customers per day. 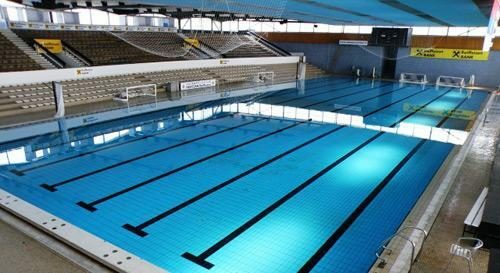 The Olympic pool has the depth of 2 meters, the length of 50 meters and width of 25 meters, fully meets the standards of world and European swimming federation (FINA and LEN). Recreational pool has a depth of 0.80 to 1.20 meters and has an attractive “water park facilities”: overflow mushroom, three swallowtails, massage wall and a central geyser. Small pool has a depth of 15 to 20 cm, and it is primarily intended for small children. During the reconstruction of outdoor pools in 2011., on both sides of an Olympic swimming pool were built concrete stands and the lighting of the entire complex was totally renovated. For all swimmers are available: a coffee-bar area with comfortable lounge chairs, umbrellas and a wooden pergola for full enjoyment. In the complex “25. May” special attention is paid to the quality of water that passes through a special system of mechanical, chemical and UV filtration. The water is filtered continuously and the water quality is controlled on a daily basis. During the summer season, water from the pool is delivered to the city health department for testing, twice a week. 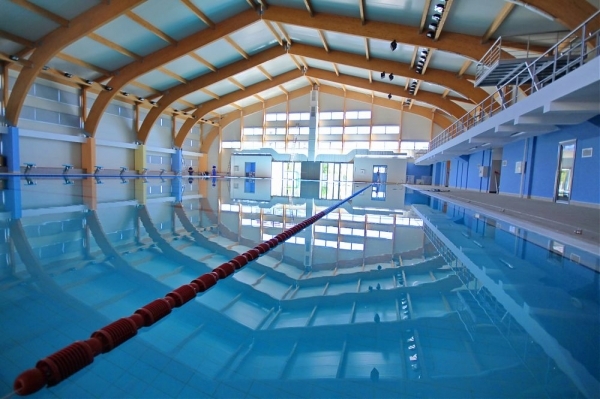 – children’s pool, measuring: 15 x 7.5 x 0.6 m.
Within Banjica Sport Center you will find two indoor pools (olympic and smaller one for non-swimmers) and two large outdoor swimming pools. Outdoor swimming pool are open from June to September. 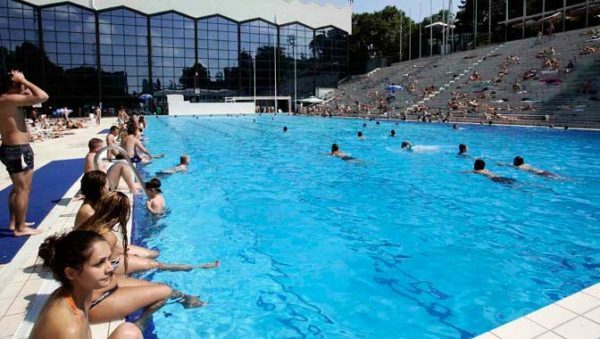 Banjica pool often attracts many Belgraders who do not live in that part of town because it is a large sports center where there are many additional activities. The center is designed for sport competitions such as: water polo, swimming, synchronized swimming, and tennis tournaments. For recreation and hobby there is foosball, billiard. Besides the pool, there are also medical center, trim track for those who like jogging, gym and sauna, as well as many other facilities.